At the time of writing this article, Ubuntu 11.04 codenamed "Natty Narwhal" is still very much in its nascent stages of development. I really wanted to take it for a spin and write about my first hand impressions on latest build Ubuntu Natty. I installed Ubuntu 11.04 Natty Narwhal Alpha 1 in my USB drive and things went pretty smooth from the word go. 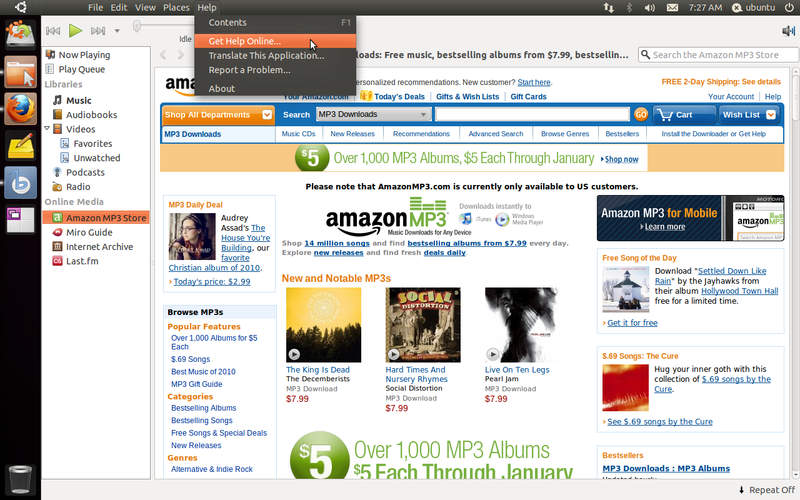 Canonical had decided to go with Compiz instead of Mutter as the default window manager for Ubuntu Unity. The very first results of integrating Compiz with Unity has already starting to show up big time in the first alpha release of Ubuntu 11.04 Natty Narwhal. Screenshot above is a case in point which show off Compiz expo plugin at work in latest Ubuntu Natty release. 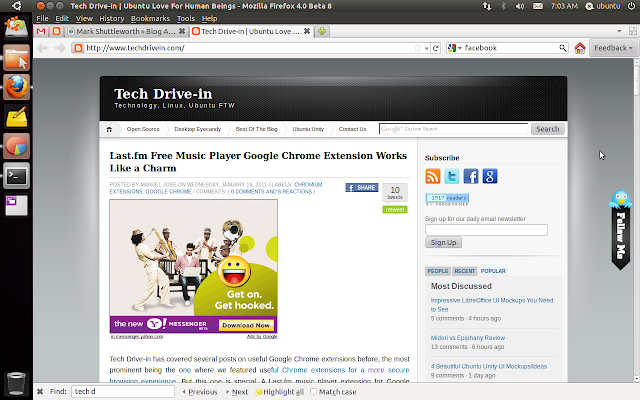 Another major limelight of this very early release of Ubuntu Natty Narwhal is nothing but our good old Firefox, only difference is that, Natty has the latest Firefox 4 beta 8 version. This is *the* best Firefox I have ever used. It feels almost as good as Chromium which is my web browser of choice in Ubuntu. Firefox 4 final release will happen sometime in Feb 2011. And hence it should available by default in next major release of Ubuntu. 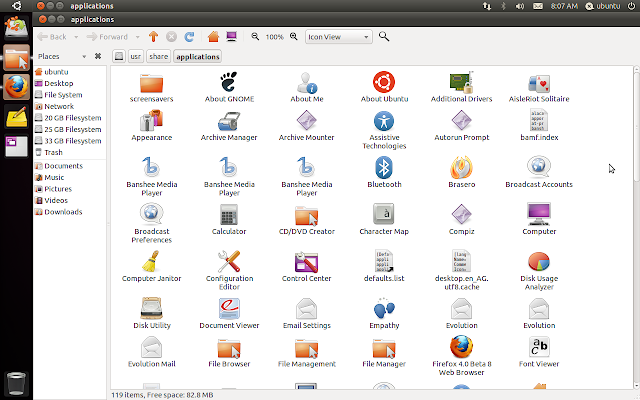 Global Menu integration is implemented perfectly well already in this latest release of Ubuntu Natty. This was a pleasant surprise for me. Global Menu could really improve screen real estate management especially for those using netbooks and smaller screen laptops. 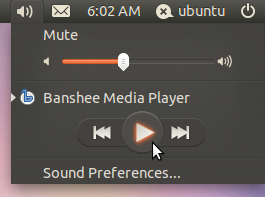 Also, Banshee has replaced Rhythmbox as the default music player in Ubuntu Natty. Though Banshee is really good, I still have a soft corner for Rhythombox. Ever improving Ubuntu sound menu is as significant as any other change. It simplifies the top panel in a big way and it has even started to look good. There is a distinct glow for the buttons now when you hover the mouse pointer over it. Small things like these could completely reinvent the Ubuntu experience IMO. The default sidebar dock has also changed by a lot, though I really would like to have the intellihide functionality available as an option at least. As usual, Ubuntu Software Center just keeps on improving and improving. The latest addition being the new "recommendations" option. Whenever you open Ubuntu Software Center, you will be presented with a set of new applications which are "recommended". This functionality is probably still in its early stages of development and you could expect a fully functional, integrated software center when the final Ubuntu Natty release happens. I felt an overall robustness with this latest release of Ubuntu Natty Narwhal already and with the integration of Compiz, things are a thousand times more stable and slick now. Apart from that, there are a number of downsides too. 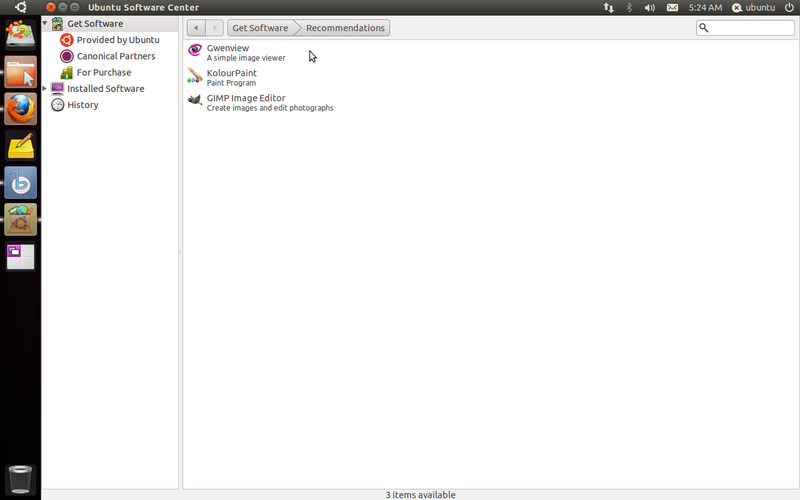 Thats how available list of applications are shown to you now in Ubuntu Natty. 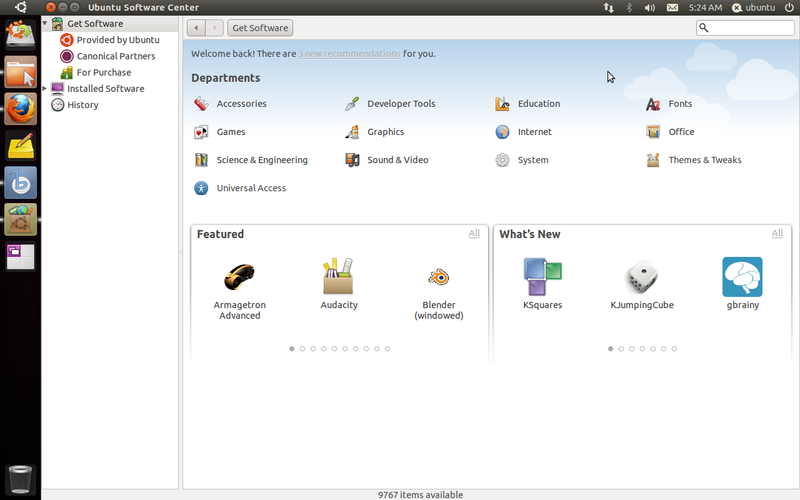 There is a small Ubuntu icon on the top left corner which is supposed to provide you with the list of applications available. And when you click on it, it will take you to /usr/share/applications directory(duh!). As you could see in the screenshot above, this particular Nautilus window is not even well integrated with Global Menu. Obviously, I was using the first alpha release of Ubuntu 11.04 Natty Narwhal and things are nowhere near the finish line. It is not fair to judge a product which has not even hit its first beta release. Lets just hope that, Ubuntu will come up with something amazing as far as primary menu is concerned. Some other things that annoyed me were the lack of ALT+F1, ALT+F2 functionalities, which for me are among the most critical keyboard shortcuts for Ubuntu. I was quite reluctant to use this made-for-netbook kind of interface on my desktop, but from the initial looks of it and the way it is evolving, I think I will use Ubuntu 11.04 Natty Narwhal as my default desktop after all. 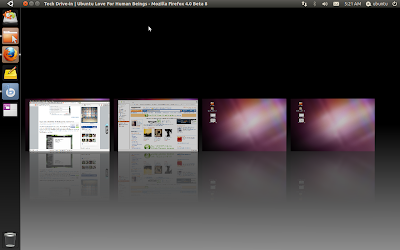 On a last note, you might also want to check out these awesome Ubuntu Unity UI mockups for a "dose of sanity."